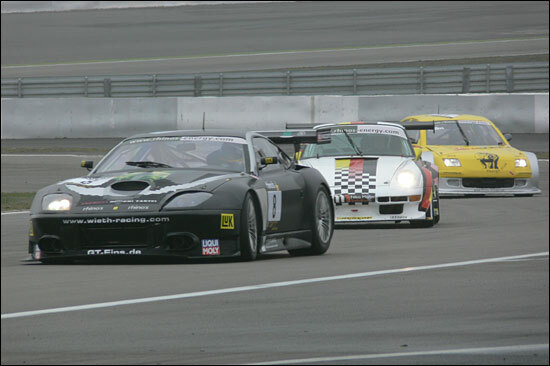 20 cars on the grid, for two, 40 minute races at the Nürburgring, marked the start of the first season of the rhino’s GT series. As you’ll know already, Wolfgang Kaufmann was the winner of the opening race of the newly-renamed series.. and race 2 too. Well done Kaufmann and Wieth Racing. The V8’Super’Star of Pierre von Mentlen and Rob Knook’s Stealth came together at the first corner of the opening race, and the V8Star had to pit with a bent steering rod. Knook continued, but became a retirement before long. Chaouki Chikhani started his Porsche from the back, fought up to fourth, but retired after an expensive-looking blow-up. 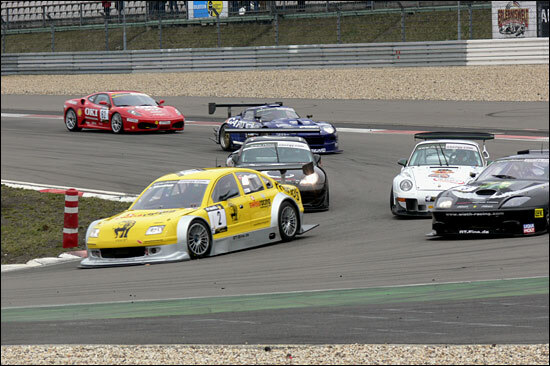 So with Kaufmann settled in the lead, Thomas Probst, sharing his Porsche 993 GT2 with Norbert Pauels, came home second ahead of André Wilke, also in a Porsche. 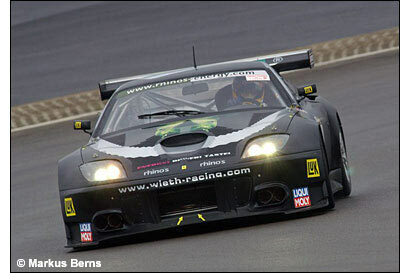 In Class EGT2 it was Heinz Bert Wolters who took the trophy. He fell back at the start, but kept ahead of the Mantis of Dutchman Peter van der Kolk. Kurt Thiim retired his V8Star with a technical problem. In the EGT3 class, Martin Dechent, Arkin Aka and Dietmar Haggenmüller in their Porsches were 1-2-3, ahead of the Ferraris of Tony Ring and Holger Harmsen. Rob Knook had grabbed pole position for the second race, on Saturday afternoon, repairs to the beast having just been completed in time. Wolfgang Kaufmann had spun in qualifying for race 2, and he started from the fifth row. It didn’t take him long to challenge Knook – the end of lap 1. The Stealth retired again, leaving the black Ferrari romping ahead again. Pierre von Mentlen had to retire with engine problems, so the podium was filled by Kaufmann, Robert Wallenborn and André Wilke. Heinz Bert Wolters and Peter van der Kolk came home at the head of the EGT2 class, while Tony Ring finished third this time, behind the 911s of Arkin Aka and Martin Dechent. Series organiser Hein Hartman was very happy with the opening event: "I had not expected that our first race would appeal to so many, said hein Hartman. „The professional presentation, the first-class races, the hospitality and the rhino's GT Party in the evening have convinced many teams to join us. I look forward to seeing everybody back at our next race in Spa (with the Le Mans Series)."